Our miniseries on vintage bathroom colors continues! 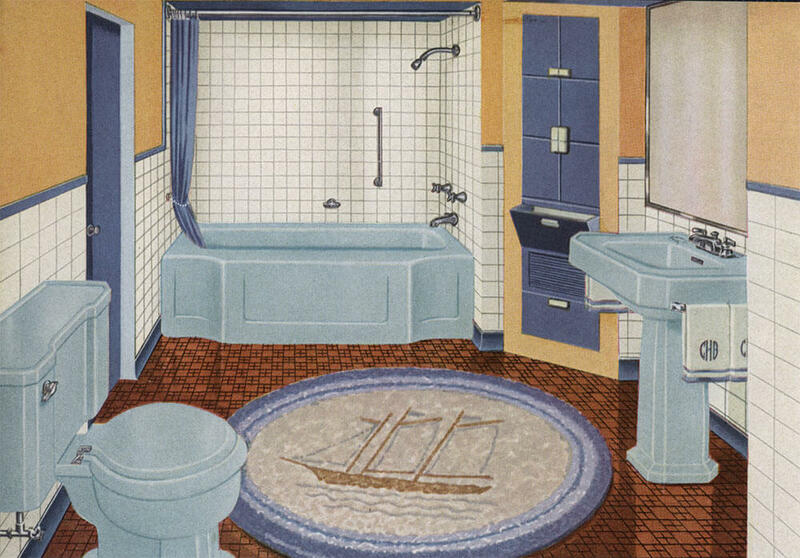 Blue bathrooms may not be quite as prolific as their cousin pink — but there were still loads of beautiful blue vintage bathrooms installed in homes all over the country in midcentury America. Today, we take a look at some of many shades of blue that were produced from 1927-1962, along with their pretty names — like “Clair De Lune.” There are even some dark navy blues in the mix. 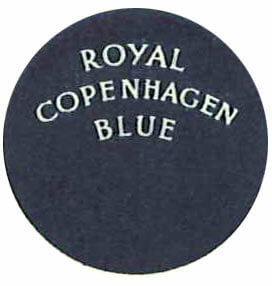 In 1930, American-Standard offered two blues — one lighter pastel blue called ‘Clair De Lune Blue’ (above) and one darker blue ‘Royal Copenhagen Blue’ shown below. 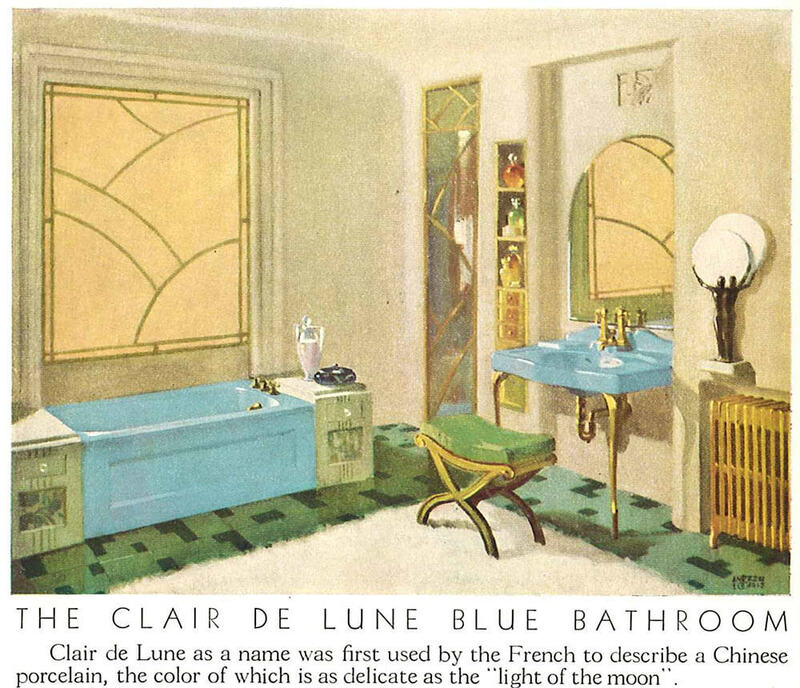 Above images: 1930 American-Standard Clair De Lune Blue bathroom fixtures from the MBJ collection/archive.org. 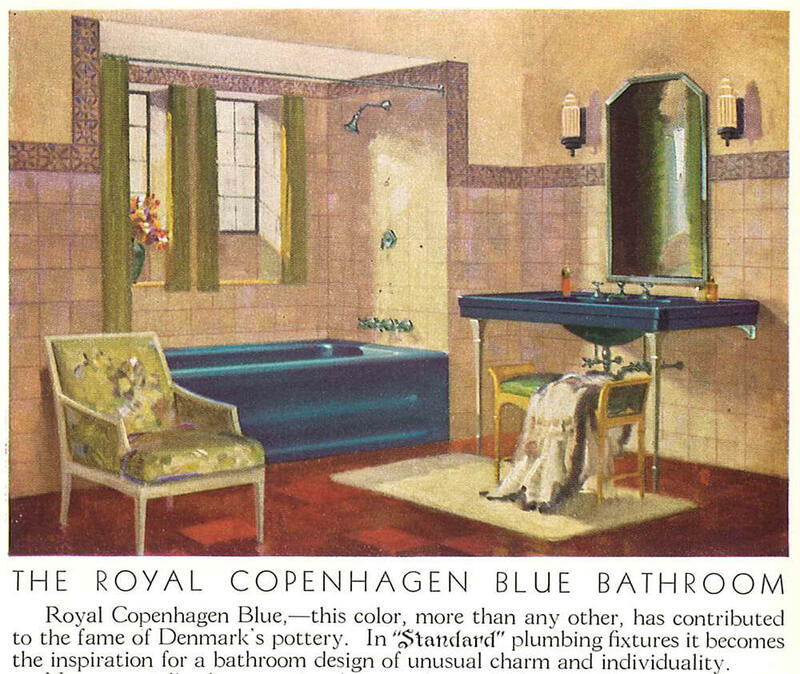 Above images: 1930 American-Standard Royal Copenhagen Blue bathroom fixtures from the MBJ collection/archive.org. 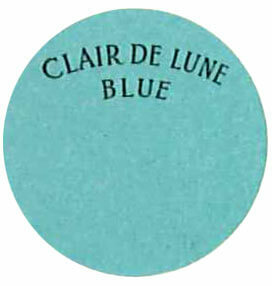 By 1950, American Standard had removed the darker Royal Copenhagen Blue color from their lineup in favor of the more popular lighter Clair De Lune Blue. Above from: 1950 American-Standard catalog from the MBJ collection/archive.org showing Clair De Lune Blue bathroom fixtures. 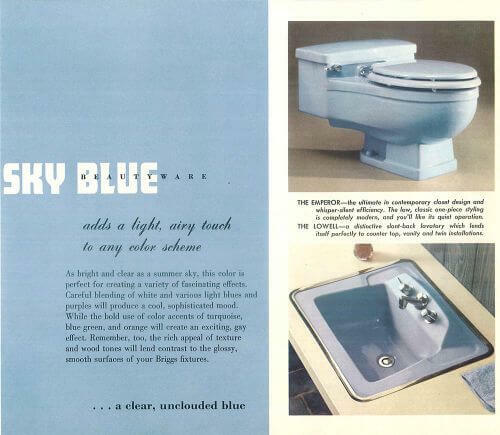 Three images above: 1962 American-Standard catalog from the MBJ collection/archive.org showing Regency Blue fixtures. 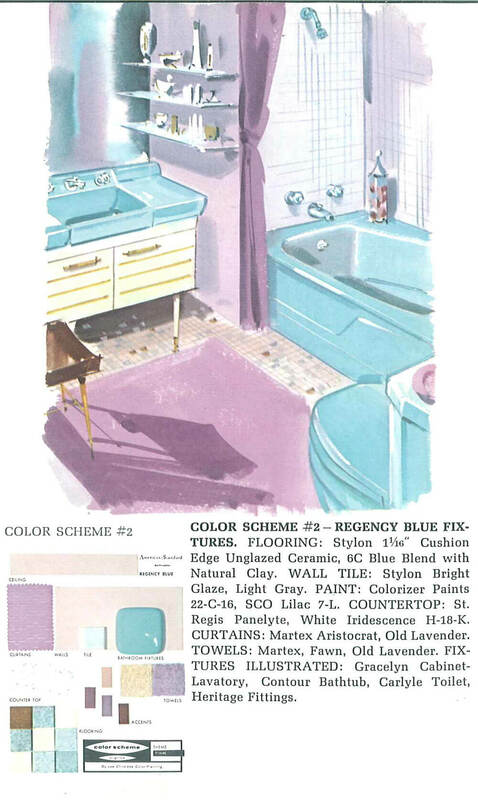 Kohler’s 1928 ‘Horizon Blue’ must have been a very pale blue/gray color because it appears to be almost white in the catalog illustration above. 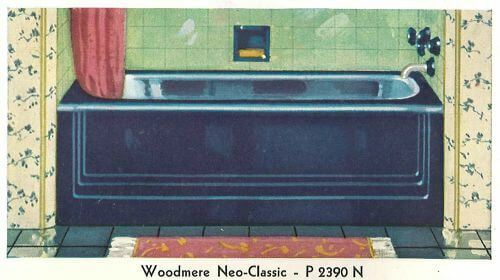 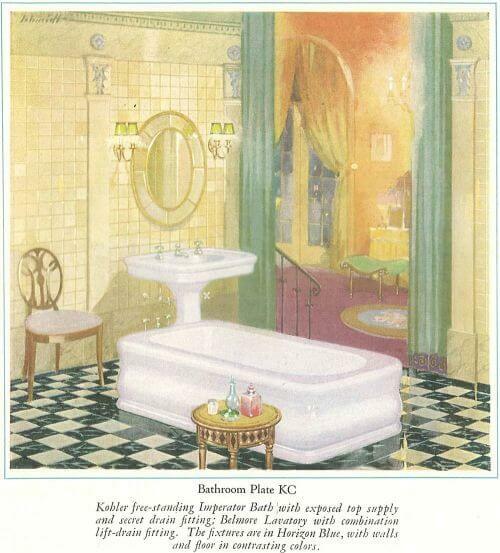 The exact same image and color also appears in Kohler’s 1929 catalog. 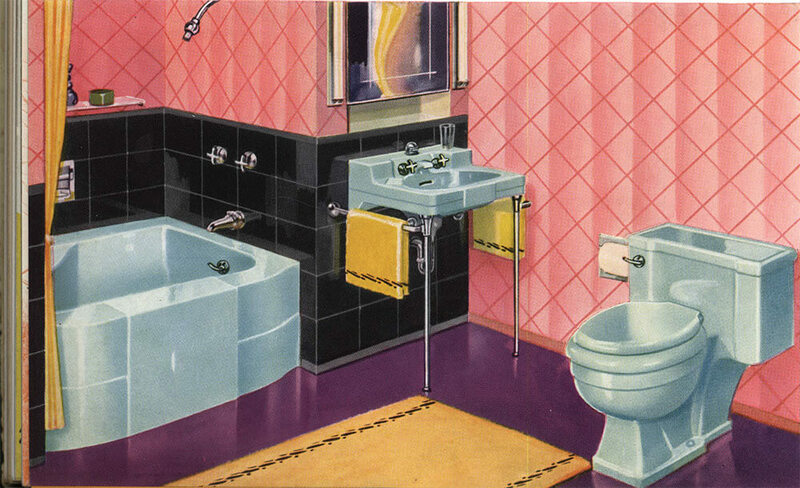 Above: Horizon Blue fixtures from a 1928 Kohler catalog from the MBJ collection/archive.org. Above: We see Kohler’s color lineup 1936 Kohler catalog from the MBJ collection/archive.org. 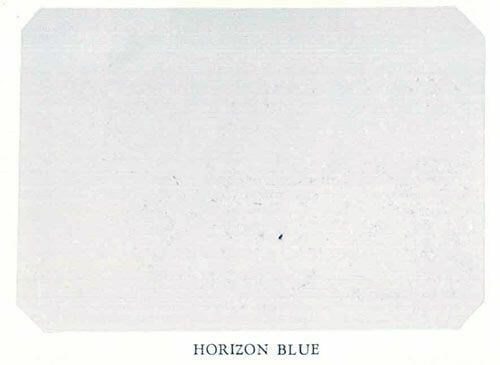 While Horizon Blue was still offered and may have been darkened, it was not one of their four most popular colors as indicated by the larger swatch size above. 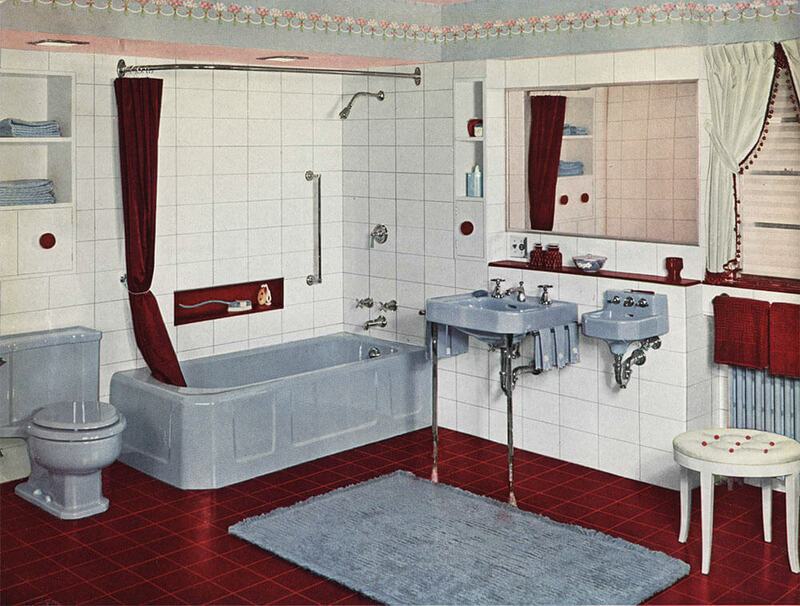 Above: In this 1948 Kohler catalog from the MBJ collection/archive.org, we see the whole palette for the year, which includes their new, brighter blue Cerulean showcased here with a lovely deep red and white themed bathroom. 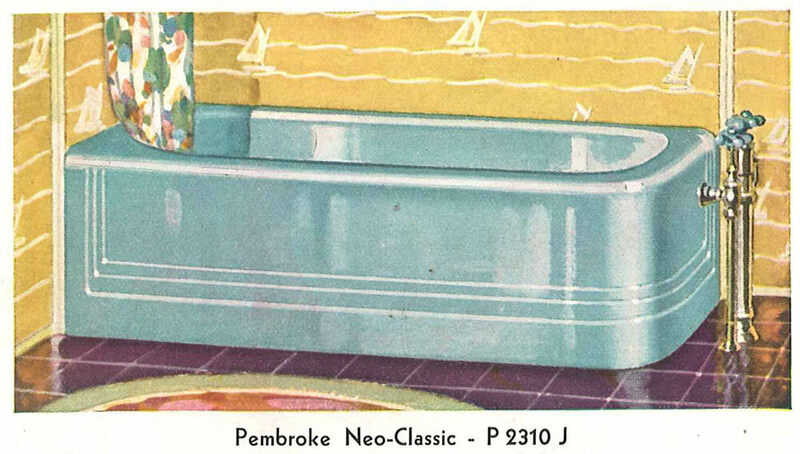 Also, note the dental sink! 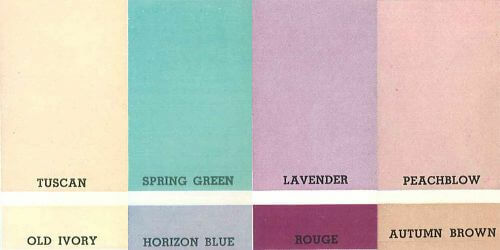 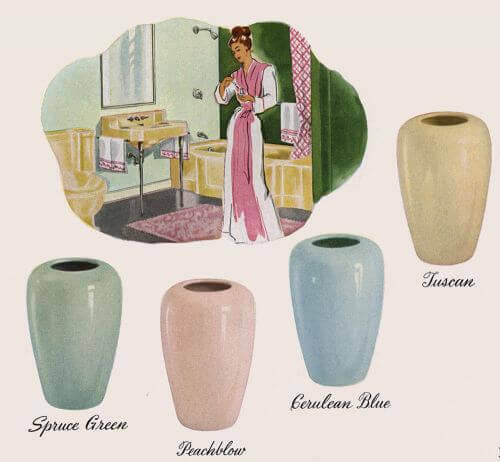 By 1949, Kohler had reduced its color offerings to just four: Spruce Green, Peachblow, Cerulean Blue and Tuscan. Two images above: from a 1949 Kohler catalog from the MBJ collection/archive.org. Above images: In this 1950 Kohler catalog from the MBJ collection/archive.org, Cerulean Blue is still going strong. 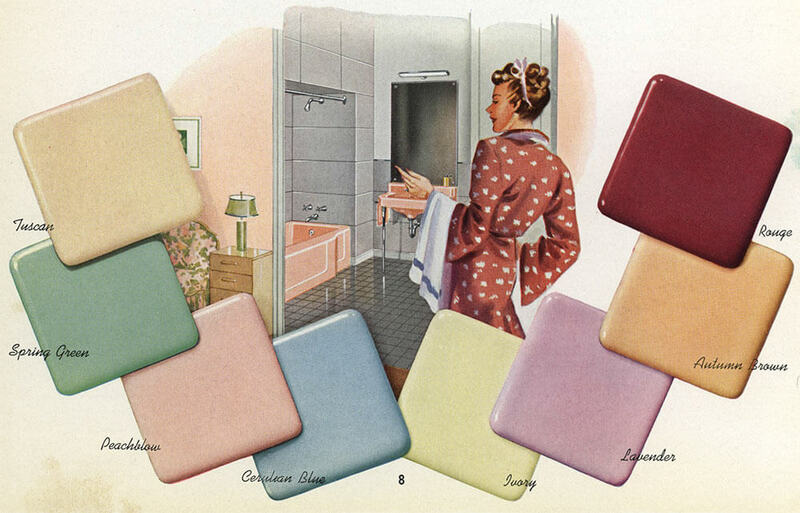 You can see Kohler’s complete color offerings — including all of their different blues — in this extensive color timeline found on Kohler’s website. 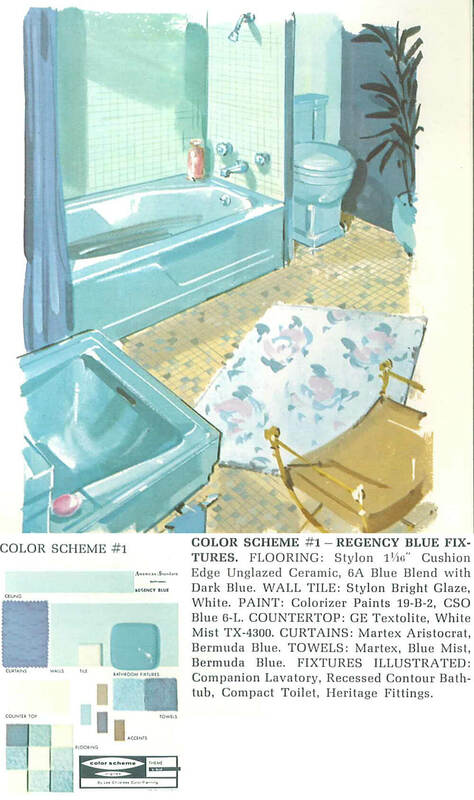 Above: This 1940 Crane catalog from the MBJ collection/archive.org shows their blue as “Lucerne Blue.” Just check out the use of color in this bathroom — purple floor, black wall, pink walls and gold towels with blue fixtures. What a bold arrangement! This 1955 Montgomery Ward catalog from the MBJ collection/archive.org offers fixtures in Sky Blue. 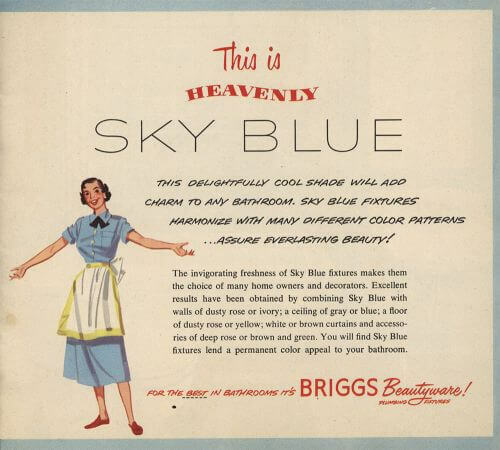 Three images above of Briggs’ Sky Blue from: A 1951 Briggs Beautyware catalog from the MBJ collection/archive.org show off some inventive decor ideas for a blue bathroom. 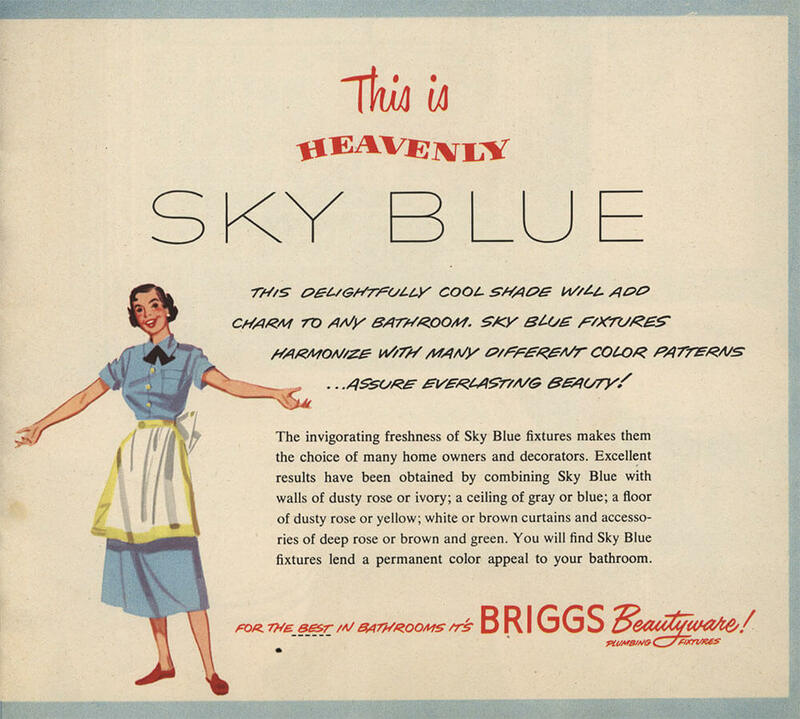 The two images above show Sky Blue from the 1950s Briggs Beautyware catalog from the MBJ collection/archive.org. 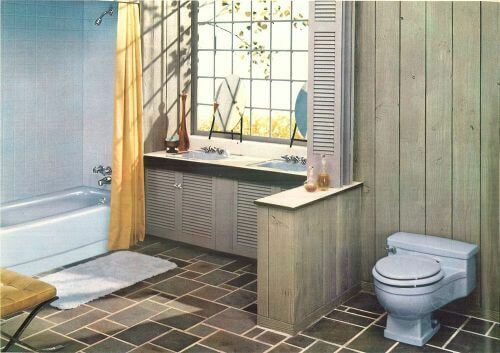 Check out that low profile blue toilet. 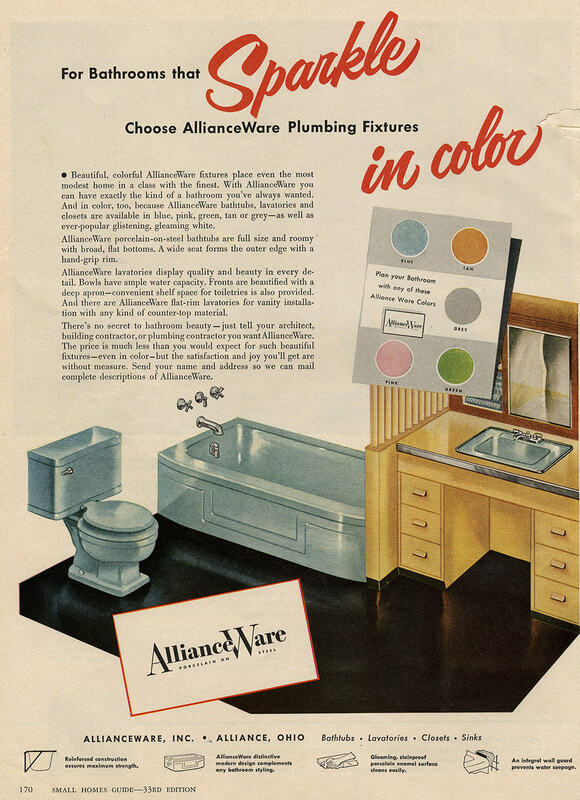 Pam found this ad for Alliance Ware porcelain enameled bathroom fixtures that includes a pastel blue in a 1950s Small Homes Guide. Above: We just love Kristen and Paul’s aqua blue 1940s bathroom with black and white accents. 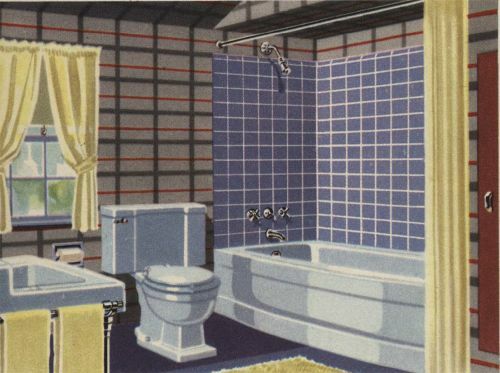 Above: Nanette and Jim built a lovely blue and white bathroom from scratch in their basement. 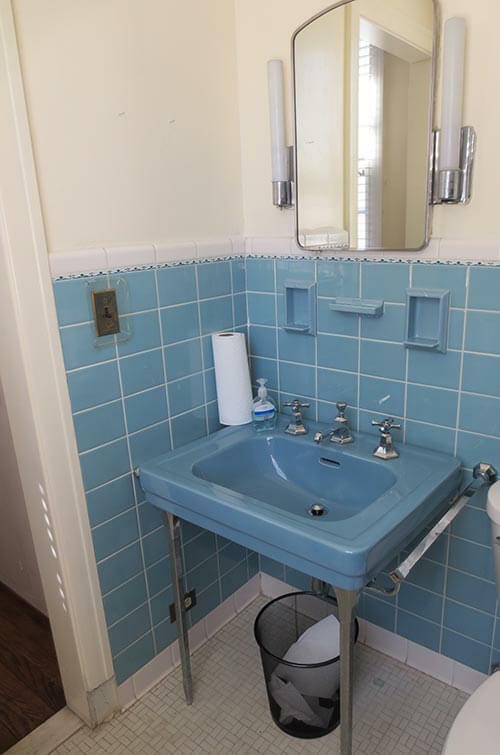 Two images above: This 1950s time capsule house had seven vintage bathrooms — two of which are blue. 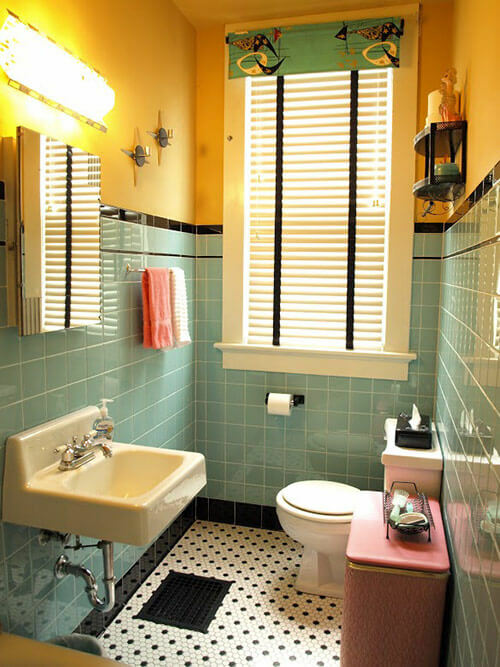 Above: The Comer House in Gallatin, Tenn. has a lovely blue and white vintage bathroom. 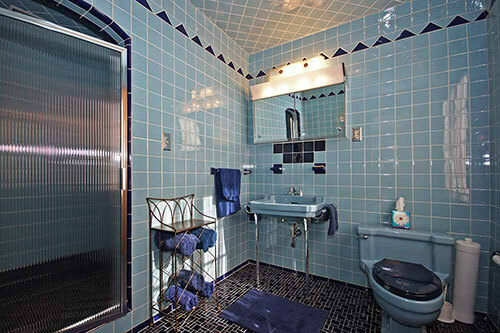 Above: Alice’s 1950s blue bathroom has a fun mosaic floor tile pattern that we figured out how to replicate. Our house was built in 1950 and we bought it with the original bathroom fixtures which are American Standard and must be the Claire de Lune. 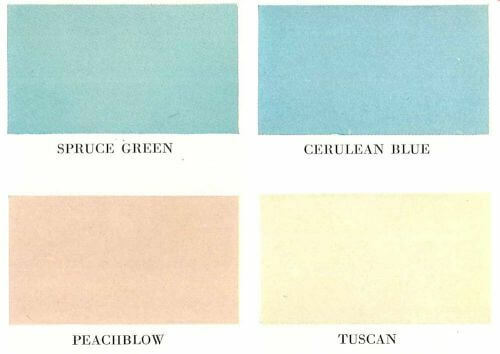 They are blue but have the slightest green tint to them (I always thought it was due to the age of them). After changing the guts in our toilet several times, we ended up having to replace it (We had already been forced to put a white lid on the seat). Then we ended up needing to take the sink out (complete with legs). So now we have a white toilet and vanity/sink but a blue cast iron tub in the Princess style. The bathroom floor is tiny tiles in a mix of blue colors. 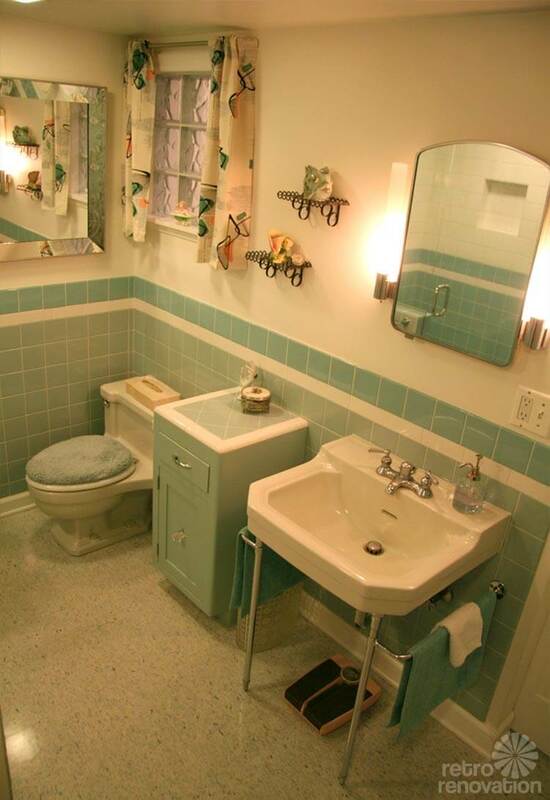 The walls are paneling (painted) with white subway tile 1/2 way up around the sink and almost to the ceiling around the bath tub. 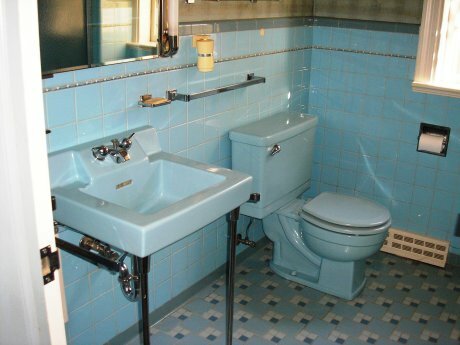 Don’t worry, we didn’t trash the blue sink & toilet. They are stored in an old one bedroom house behind our house. 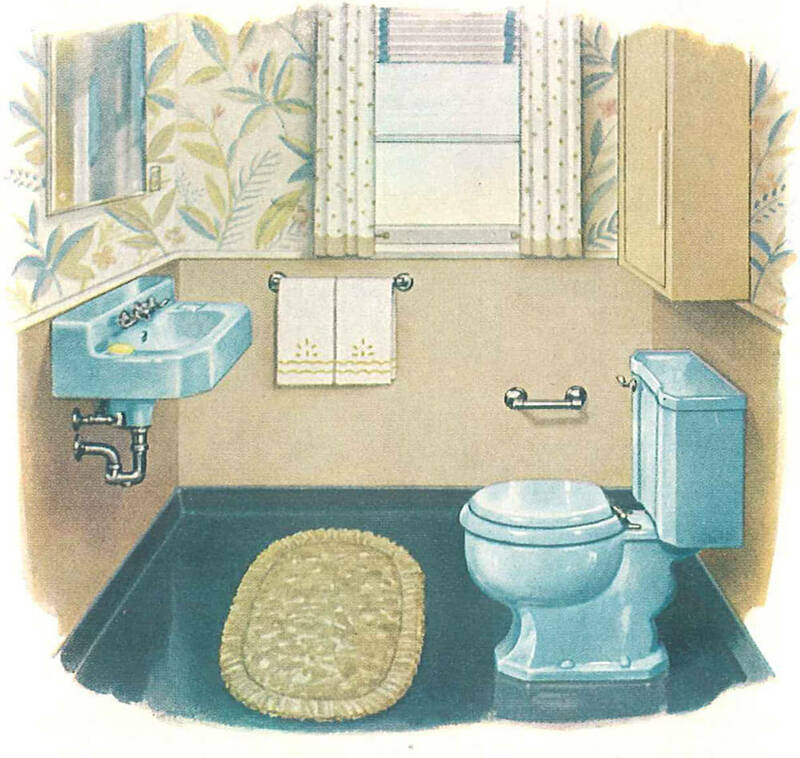 We love our 1949 blue bathroom! 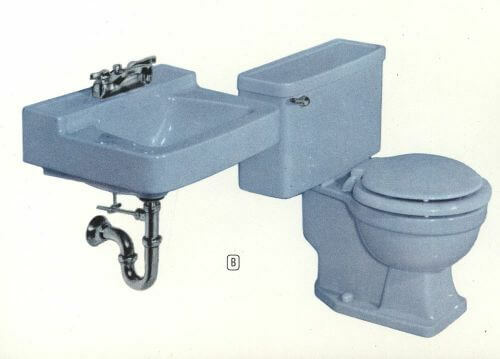 American Standard blue toilet, sink and the “net-angle” tub — all installed in blue terrazzo that goes 1/2 way up the walls! 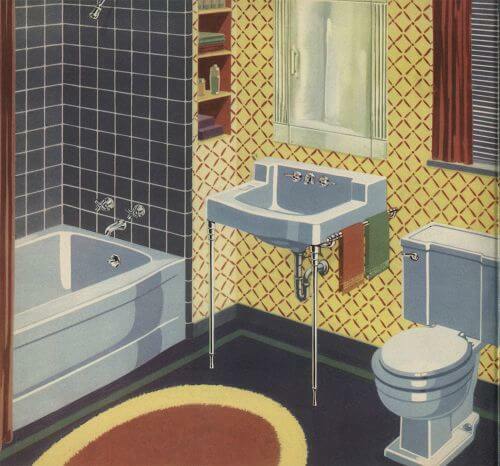 (If the fixtures ever get damaged we are TOAST). The shower is terrazzo too, but the base is grayish white instead of blue with the same assortment of marble chips. 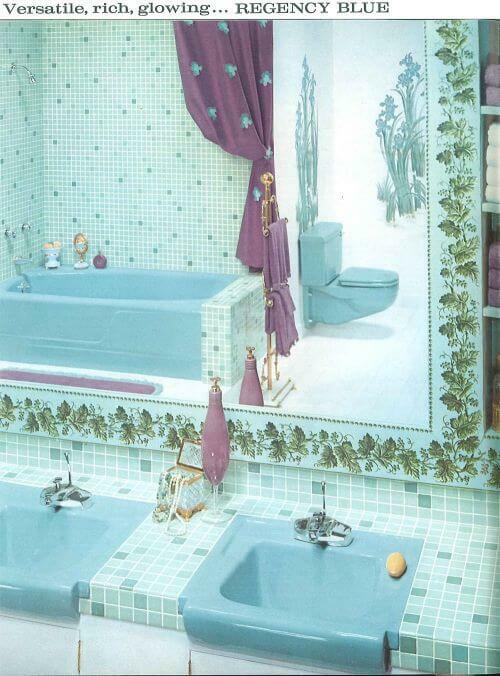 So very groovy. 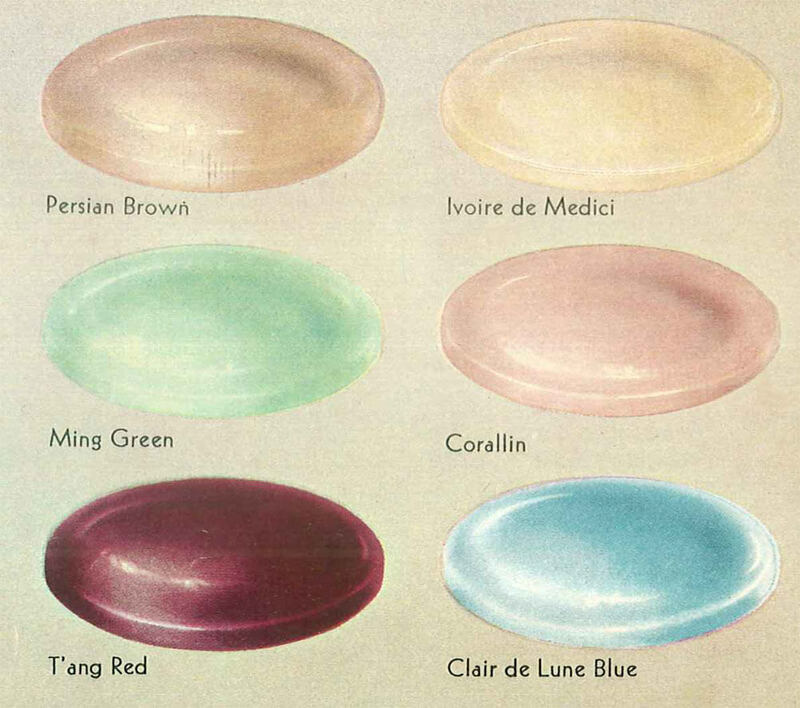 Is there anywhere where these can still be purchased? Is it possible to be part of those who have sets to sell? Ours appears to be the ’49-’50 Kohler Cerulean. 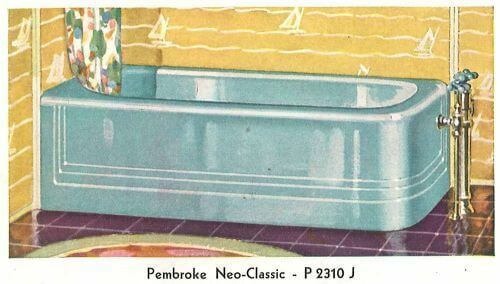 We have all 3 pieces in perfect condition and are curious if we could find someone truly interested in good, time-past, bathroom “furniture”. 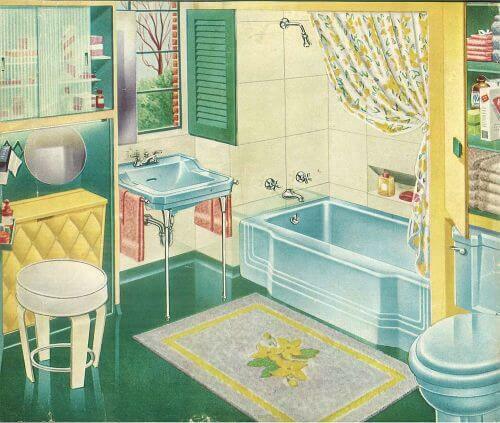 Your reply will be helpful. 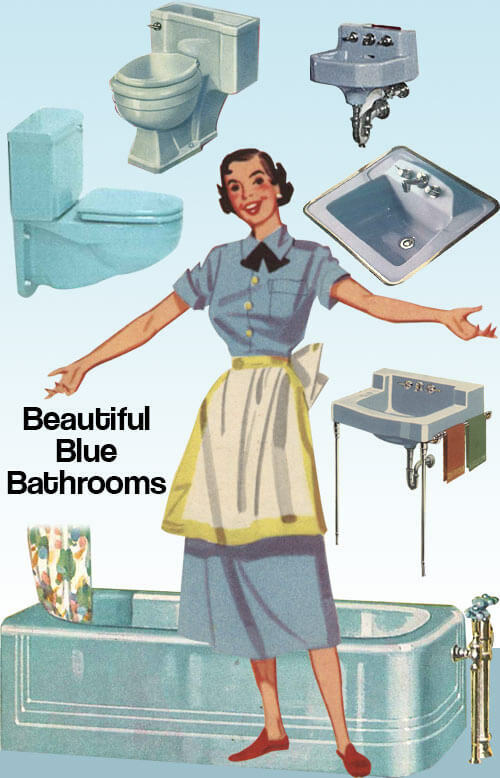 Hi Tammy, put them on craigslist. 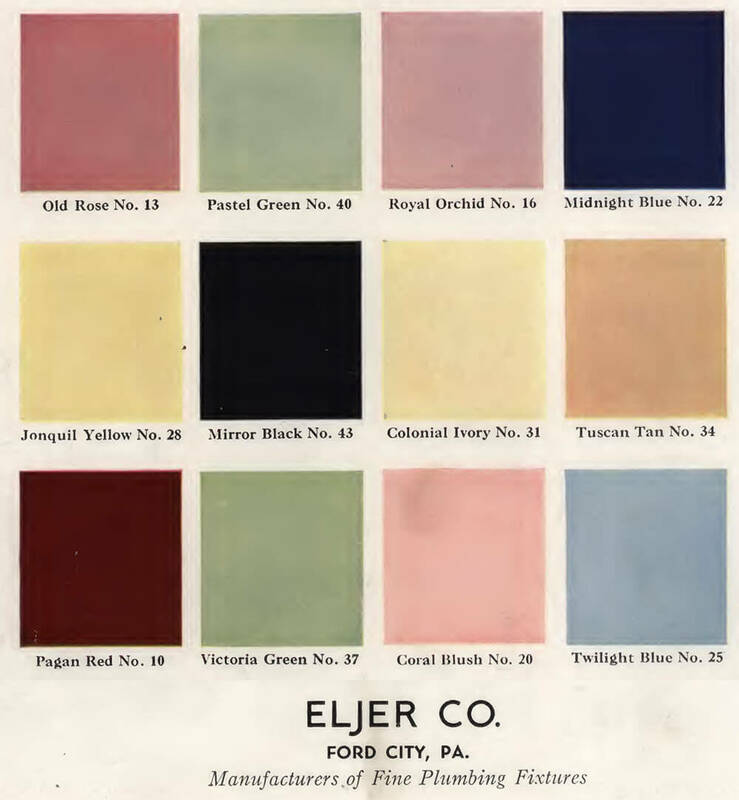 No buying/selling in the comment threads on the blog, or it becomes chaos.